There is never a lack of challenging times for us. Personal loss, illness, or natural disasters force us to seek out resources both within us and in our environment.Resiliency is the ability to bounce back after a difficult time. Some not only are able to move forward but even demonstrate Post Traumatic Growth. It describes when difficult life events happen, we can find ways to move forward, grow, and find a new balance for well-being and healing. 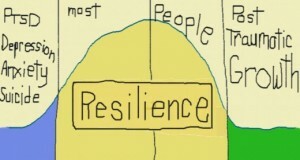 Current research shows that like the “bell curve” you see on the resiliency picture, most of us are able to at least go back to the level of well-being ((happiness) we had before our challenge. We need time and patience to do so, but it is quite possible. There are however, some who stay stuck in their struggles after loss that prevents their well-being or health. Clearly finding the professional help one needs when unable to return to a former level of functioning is important. Those who are able to grow from adversity describe they think differently and have more emotional maturity than they had before their challenge. gives you some specific ways to build the resiliency muscle which is the key to more happiness and meaning. Laura King, Ph.D. at the University of Missouri has conducted research that shows that a sense of happiness and a sense of meaning are related. Those who express more happiness have a greater sense of meaning in their lives and vice versa. She stresses that it is myth that meaning in life is mysterious or hard to find. You just have to look around and identify those behaviors, situations or relationships that bring you an internal sense of joy and commit to paying attention to them in your daily life. Social connections, a reasonable good mood, and connections in the environment are some of the defaults for happiness and meaning. She also states that another myth about meaning in life is that it requires reflection and deep thinking. Searching too hard to find meaning is not the way to feel it. It is not a rare accomplishment for people to have a meaningful life. Take a look at these old blogs and find one specific way to take your struggles and build your resiliency muscle to bring more happiness and meaning into your life.